“I have placed my first Seek advertisement and will be reviewing the 38 responses this weekend and interviewing next week. Once I have selected the best candidate I am looking for the best process of “inducting” them to the Pure Bookkeeping System. I have used the Skills and Speed tests with two people and I think they are great! “I just wanted to tell you that the MYOB test that you set up and the process questions and points made this interview process something much greater and easier than ever before. These processes assisted me to find the best person for the job and has just saved me thousands of dollars employing the wrong staff. Big thank you to you for all your help and support. “Before I started using the Pure Bookkeeping System creating a successful bookkeeping business seemed insurmountable. At that point, my confidence was low, I wasn’t too sure what was doing in the business, I had terrible clients who didn’t value what I was doing and I didn’t know how I was going to attract more clients. I felt like I was just chasing my tail, and was even thinking about packing it in and becoming a subcontractor. Then I saw the Pure Bookkeeping System and I knew I had to had to have it … and I haven’t looked back. Six months after implementing the PB System, by business, and my life, is unrecognisable. I’ve sacked the clients that I didn’t want to work with, and followed the system to attract better clients. With my new clients, I simply follow the system and right from the start ay this is how I work, this is what I charge and this is what you need to do. I feel like I’m in control, and that I have a real structure to what I’m doing every day. “Coming from a mining background, I understand the importance of documented business processes and having up to date templates/checklists. Not only has the Pure Bookkeeping System provided this, but it has also given me a platform to scale my business, the drive to investigate/apply new technologies, and the added security of knowing I am completely up to date with legislation changes and industry best practise. “I used to work as one of Debbie’s Bookkeepers for a few years before moving to NSW and starting my own business, so I have seen first hand how successful she has been at growing her business. “The Seven Secrets Seminar was fantastic. 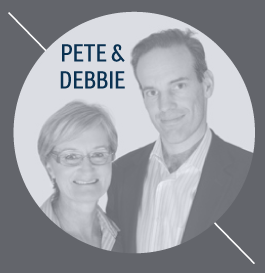 I loved the fact that Pete & Deb are as passionate about empowering business owners around their finances as I am. I can see that the Pure Bookkeeping System will help me achieve my goals with more efficiency and I can’t wait to get started!